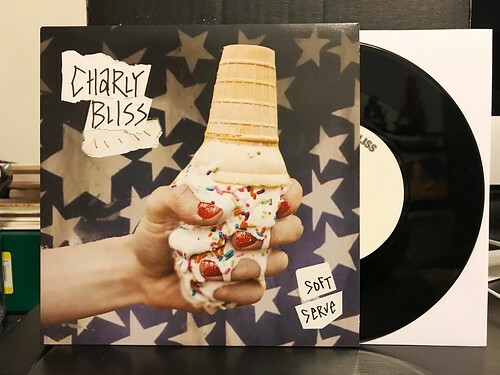 I Buy Way Too Many Records Dot Com: Charly Bliss - Soft Serve 7"
After being so completely and utterly blown away by the Charly Bliss full length, I wanted to jump backwards and pick up their only other release, this three song 7" from 2014. Being so much older than their new record, I was wondering what I was going to think as I've read a few times that the band made a pretty significant change in sound while working on Guppy. I can report that this older 7" is still pretty good. It does not reach the heights of what they eventually achieved with their album, but it contains two pretty solid and catchy songs. "Love Me" has a strong hook and some pretty good melodies, but it's much fuzzier and more raw than anything on the album. Usually I would prefer that in most bands, but Charly Bliss is one of those rare animals that benefits from a cleaner, more polished sound. On the B side, "Urge To Purge" falls in line more with their recent hits. It brings a huge wallop of 90's nostalgia with a big chorus and some dynamic guitar work. "Strings" is a total outlier as it's not sung by usual singer Eva Hendrix, who is relegated to backing vocals on this one. I can't say it works as it's probably the weakest song I've heard by the band. It just sort of plods along and doesn't have any of the band's usual barely contained energy. As a whole, the 7" is a fun listen, but it doesn't come close to what the band achieved on Guppy. Start there if you're new to the band.